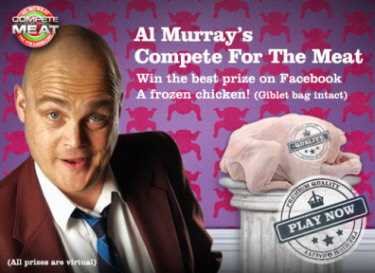 Comedian Al Murray is back as The Pub Landlord with a new TV program, called ‘Compete For The Meat’ where contestants get to try and win a side of meat! The host asks the questions himself to 4 teams, each consisting of 2 people. Whoever wins gets to take home a nice frozen chicken. Now that’s what you want to win, beat that for a prize Family Fortunes! The new show started on Thursday 19th May, it is on at 9pm, only on Dave (which is; Sky channel 111, Virgin TV channel 128, Freeview 19). And if you to have fun as well you can play the Facebook game (update: game is no longer available) online. Al Murray looks back on full form with this new quiz program, here is a funny taster clip for you. Here is also an interview with the big guy answering questions about the show. Want to have a crack at playing? You can also have fun via this free Facebook game (update: game is no longer available). Good luck to all players.